Peppermint Bark Cheesecake Shooters are made with a no-bake white chocolate peppermint cheesecake piped over a chocolate cookie crust. Prepare your crust by combining Oreo cookies and chocolate chips in a food processor and blend until completely pulverized to crumbs. Add warm butter and pulse again until completely combined. Set out 22-24 plastic 2-oz shot glasses and portion 2 teaspoons of Oreo crumbles into each shot glass. Gently tamp down with small spoon or rounded end of teaspoon. Set aside. Combine your white chocolate chips and 1/2 cup (118ml) of heavy cream in a small saucepan over medium-low heat, stir frequently until chocolate is completely melted. Pour into a large heat proof bowl and allow to set until cooled to room temperature (pouring it into a large vessel other than the saucepan will help it cool faster) -- about 30 minutes. While white chocolate mixture is cooling, pour your remaining 1 1/2 cups (357 ml) heavy cream into a clean, dry bowl and whip with an electric mixer until stiff peaks form. Store in refrigerator until ready to use. Once white chocolate mixture has cooled, place your softened cream cheese in the bowl of a stand mixer (or a large bowl & use an electric hand-held mixer) and beat until smooth. Add white chocolate mixture and beat until well-combined. Gradually add powdered sugar until well-combined. Stir in extracts. With mixer on low speed, stir in whipped cream mixture. Increase speed to medium-high and beat until well-combined. Transfer mixture to a large Ziploc bag and snip off about a 1" corner*. Pipe (squeeze) filling through the snipped corner, filling each shot glass to the rim. 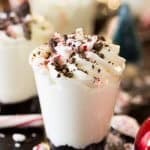 Top dessert shooters with chopped chocolate and crushed candy canes just before shooting (if you add them too far in advance the candy cane pieces will dissolve). Store in a sealed container in the refrigerator. *I used a piping bag and a large Ateco 846 to pipe the swirls on the top of each shooter. If you overfill the shot glasses above the rim as seen in the pictures you will only get about 20 dessert shooters. Peppermint Bark Dessert Shooters https://sugarspunrun.com/peppermint-bark-dessert-shooters/ Find more great recipes at SugarSpunRun.com!